How was your week? High tens to you if you had a healthy and productive week and big hugs if you didn't and life conspired against you. The good news is that today is a new day! I love that every 24 hours we are given the opportunity to shake it off and start again! Still, I'm getting too old to shake it off effectively so I really should break down and buy some towels. Since I saw you last I tried a new-to-me technique of wrapping a couple three rubber bands around an acrylic block and stamping with it. Cool. I stamped my rubber band block and I thought it looked like modern art waves on the ocean. The sailboat and sediment are from Paper Smooches. Here is a closeup of the little glossy sailboat. Cardz 4 Guyz: Travel or transport. CAS Mix Up: Rubber band technique, stamping, and fussy-cutting. Simon Says Stamp Monday: Mythology; inspired by a story: The Little Sailboat by Lois Lenski. This NBUS little girl is from Flourishes. She is supposed to be blowing a dandelion, but I had to perform emergency surgery so she could hold an umbrella to keep her pretty frock dry when a sudden rain shower appeared overhead. The umbrella and sediment are from Stamps of Life. The rain is an ancient SU stamp. The inside says, "... you are a friend of mine." Those are May flowers, come early, but they are holding off showing their colors until May out of respect for those folks who are still getting April snow! Also because Hammy usually colors small areas, but I can't tear him away from seeing who comes to play in his Twofer PET challenge! Love that rubber band water, Dolly! The sailboat looks very happy and shiny there! Awesome chair too! They must have had a big block and huge rubber bands (snicker)! And aren't you clever to switch a dandelion for an umbrella! You are so creative! Thanks for sharing with us at CAS Mix Up! I have never tried the rubber band technique, although I've heard about it and seen a few examples online. I wouldn't have thought of using it for water. What a good idea. Love your silhouette card, too, and the sentiment is great. 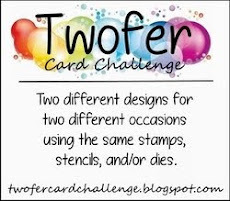 Now I've got to head over to the Twofer Challenge and get inspired by the entries there. I'm glad your surgery was so successful, Darnell. That little girl looks perfectly happy to stand in the rain with her new umbrella. 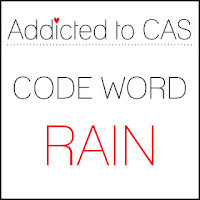 Thanks for sharing her with us at Addicted to CAS. I love your rubber band ocean too. Love how your card turned out! I've played with rubber bands on a brayer before, but never thought of an acrylic block. Cool rubber band background Darnell and a cute card! But your post-op patient steals the spotlight here for me. Your successful surgery resulted in a VERY SWEET card! Oh Darnell, the rubber band technique is so perfect for waves and I love that cute little boat. So clever to give her an umbrella! The rubber band background is perfect for the sail boat! 2 great cards, my friend! Thanks for the well wishes--ankle is almost well, so I was very fortunate! What a gorgeous pair of cards Darnell - love your ship and it's sea, and that wee silhouette girl in the rain is stunning. Two brilliant creations! I have never known about rubber bands technique before seeing your work with stamp block (and Mary's one with a roller brayer). It's a very interesting technique, such fabulous sea you made! Love he glossy sailboat on the waves, too! 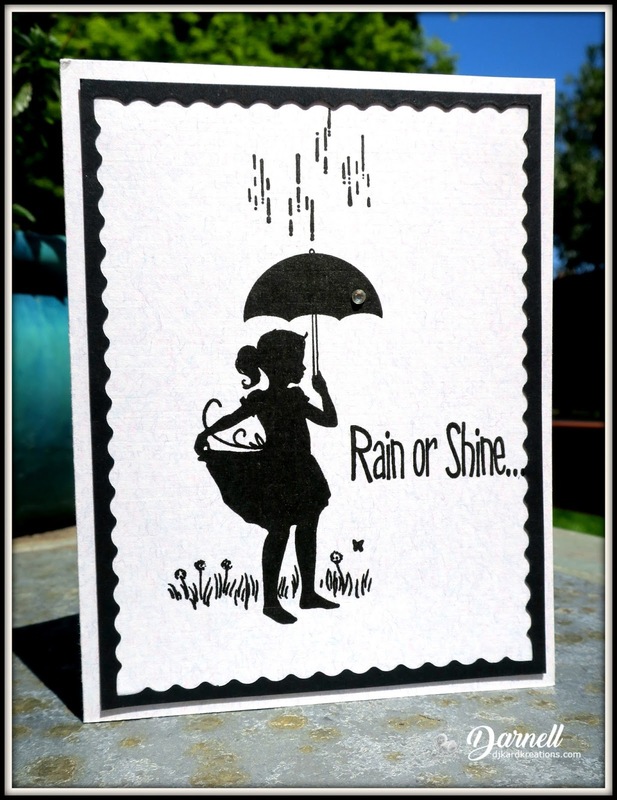 Fab stretching of your dandelion girl stamp, nobody could have said that the umbrella isn't part of it :) Adorable card! Love the rubberband waves, they look so effective. The cute sailing boat just finishes the card perfectly. Hi Darnell, Both lovely cards. I like the effect of the rubber bands. Two beautiful cards Darnell, I love the rubber band background (must give this one a try). Pretty cards!! I have seen the rubber band technique but have not tried it yet. What darling cards Darnell! 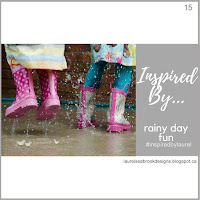 That rubber band technique has been peeking out a bit, after seeing your card I am itching to try it again, and your darling rainy day card pairs beautifully with it! I am so surprised. I thought you only played a surgeon on TV. But here you are in real life cutting up! These cards are so clever. I love the rubber band water and your surgery was successful. She is adorable and I love the silhouette look. Woo-hoo, I get to wear my Cardz 4 Guyz hat while commenting on your blog. I don't think I've ever been able to do that before! I love, love, LOVE that rubber band ocean you've created, once I get myself sorted out and back into crafting mode I am going to give that a try. Super twofer today Darnell. I love the rubberband trick. I had never heard of it and it makes for fabulous waves. Your silhouette card is so clean and elegant. Wonderful decisions and stamp usage here. Two terrific cards today, Darnell. I adore what you did to create the waves. I think you were super successful in the look you were trying to achieve. I think the silhouette on the second card is so charming and sweet. Great job here on both! Thanks so much for sharing!! Hugs. That rubber band technique was perfect for that sea scape!! Looks so cool!! I forgot about this technique and need to dig out my rubber bands again. Your second card is simply spectacular. Lovely design on both of these cards!! 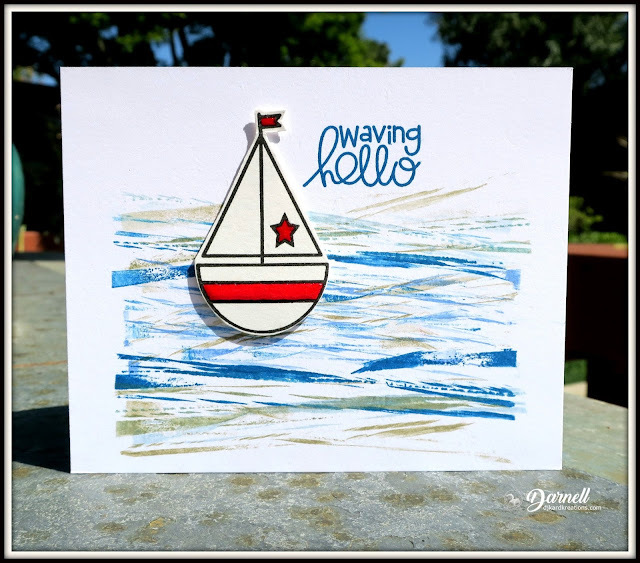 Hi Darnell, I love your little sail boat card, your waves looks so cool and a sweet little boat. So many are trying that old technique of using rubber bands to make backgrounds. 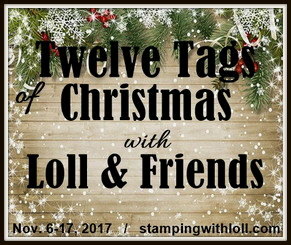 I think that was one of my first stamping tools other then a few stamps. I used a brayer with rubber bands on it lots of times. But I sure love the waves you created for the boat design. This is so fun and really does look like a rocky sea. I love your little girl with the umbrella. I can see why you needed to protect her pretty frock when that rain shower started up. Your surgery went well as she seems to be well covered with the umbrella. Thanks so much for sharing your wonderful card designs. Have a great weekend now. Cool technique with the rubber band stamping Darnell! I will have to try that! Once again fresh and fun cards. Love the rubber band idea, think I saw an YT on it but can't remember who's or when. Literally losing my mind. Sad, isn't it. But love seeing that you've managed to be so beautifully productive. Good to know someone has. I'm still mulling over what to do for Hammie's Twofer challenge...the mind I lost doesn't seem to be very fast when it does come back to me. 'A life on the rubber band 'doesn't sound quite as good as 'a life on the ocean wave' but love the effect that it has given and your cute little boat, one other good thing, you won't get sea sick on a rubber band. Now the second card reminds me of the song 'Any umbrellas ' how old is that one but not sure if it was just an English song. Love the black and white. I will have to remember the rubber band technique! Cute cards! Hmm, I think I'm going to have to try that rubber band technique now that I've seen it. Great background for just about anything, and your chair pattern isn't bad either!! Clever you to see the chair fabric and create your rubber band water. I love that you inked in 2 colors, as it certainly did a great water look. 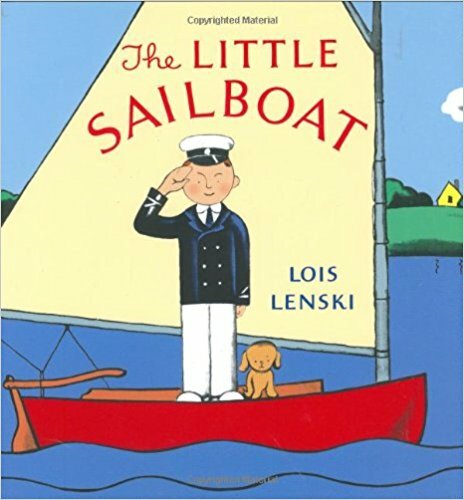 The little sailboat is just delightful floating atop this. And you will be qualified for a surgical license with the work on the little silhouette. Would never have guessed the umbrella was added to her hand! Love both these cards! TFS & hugs. Oh yes, WOW! What a fab technique with the rubber bands! Never heard of that and your beautiful card sure makes me want to try that! Totally love your black and white silhouette card! It is really pretty with no other colors added—something I need to learn to do! Hugs! Great card with the rubber band stamping and it does look like ocean waves. The boat is cute. Love the silhouette stamp too. Two great cards. Wonderful cards Darnell. Silhouette cards always intrigue me and they have such a wonderful quality. Yours is stunning. 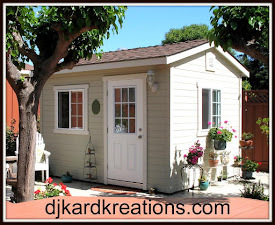 Thanks so much for joining us for our "All Occasions Challenge" this week at Watercooler Wednesday. Great cards, Darnell! I love the silhouette friendship card. The emergency surgery you performed is flawless. I would never have guessed that a dandelion had ever been held in that little hand rather than an umbrella. What a great idea, getting more use from a lovely stamp. Thanks so much for joining our Watercooler Wednesday Challenge this week. Fabulous cards. Love the rubber band technique - you have done an amazing job and every time it would look different. The surgery you performed looks to have gone seamlessly. I have the flourishes set and really should give it (and most of my sets!) some more love. Love what you did with the rubber band technique!! What a stunning card Darnell and Your alteration to the second card - adding the umbrella is terrific! Oh my I needed one last week I can tell you! Your waves look fantastic, Darnell! I love how you added the components of the enamel to the boat, now it looks amazing. This card is stunning, Darnell. The second great card uses a monochrome beauty of simplicity. It looks really beautiful. Two amazing cards here Darnell and as always your posts are a joy to read. I just had a couple of slightly worse weeks and your wonderful attitude towards life made me smile so thank you for that! Love love love your silhouette card for us at Ink -great job with stamp surgery to create this unique design. I love the completely black and white look.T hanks for joining us at Inkspirational! Your silhouette card is so striking, Darnell! There is nothing like the simplicity of black and white! What a great idea to alter a stamp to make it fit the purpose you need. Thanks so much for joining us at Watercooler Wednesday this week! D, I am so often inspired by textiles, and dish towels! 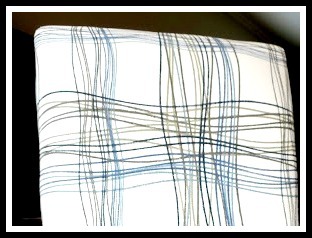 LOve that you've been inspired by your chair - it is a wonderful fabric! you've floated your boat, beautifully - and the surgery was a huge success! Well, how cute both of these cards are! Fantastic wavy rubber band background with your cute sailboat and perfect sentiment. Love that! And your silhouette girl -- I would never suspect the umbrella and rain were not part of the original stamp. What fun! Hoping I can make my Twofer Pet cards soon. This is a great pair of cards, and I really like that rubber band technique with the tiny sailboat! (love your chair too BTW) Great rain or shine card with all of the perfect elements! Well done on both! Awesome rubber band card, Darnell. I like how your designs turned out. And the second card is so adorable. Hope you are doing well, my friend. Oh love your "new" technique - I'm sure I have some stamps that rubber bands will work with. I have put rubber bands around my brayer before but never an acrylic block. The little girl with umbrella is precious - off to play a bit. Your rubber band background came out great and makes fabulous waves for your cute sailboat! And your little girl in the rain is adorable in black and white! Love them both... the rubber band background and the sail boat makes me long for summer. You are so clever! I often wish I had an ocean wave stamp and here you invent one of the easiest and cheapest techniques to get one!! You're on a terrific roll and appreciate all your encouraging notes! 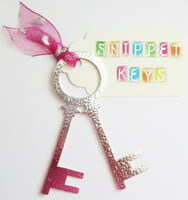 The stamping with the rubber bands is so cool! On my list of new techniques to try, love how you created an ocean with them. The second card is so sweet I am very fond of silhouette stamps and she is darling. Cute cards...and great job using that rubber band technique...something I have never tried...but It's going to go on my to do list! Hope you are having a good week! Great cards! Thanks for joining us at Watercooler Wednesday Challenges! Great technique to use for your water! I just watched two videos using rubber bands and am really intrigued with the different effects that can be achieved. Love your sweet little girl too. Just wish someone could send some real rain our way! What a lovely pair you have put on display for us......cards of course. Loving the rubber band technique. Its nice to know that there is something else to do with them other than make rubber band balls. Did the chair come with that pattern or was it one of Adam and Henry's post modernist toddler moments?